For this dish, I was inspired by 2 appetizers I enjoy - potato skins and jalapeno poppers. I like my potato skins topped with crispy bacon, cool sour cream, melted cheese and some scallions for color. What I don't like about potato skins is how they can be pretty greasy and are too messy to eat as finger food. When it comes to jalapeno poppers, I prefer them cream cheese filled and love that they are small enough to really pop in your mouth. So to combine the two, I used small Yukon gold potatoes and filled them with a bacon and cheese mixture then baked them. These were gone very quickly, maybe too quickly. All I remember after putting them on the table was everyone sitting there, with their eyes closed and hearing "mmmmm....." in stereo sound. In a saucepan, add the potatoes and cover with water. Boil the potatoes over medium high heat until tender. Drain and allow to cool. When the potatoes are cool enough to handle, cut off a small piece of each end - this allows the potatoes to sit flat. With the ends cut off, cut the each potato in half, crosswise. Carefully scoop out the middles of each potato half with a melon baller. Save the scooped out potatoes to use later or for another recipe. 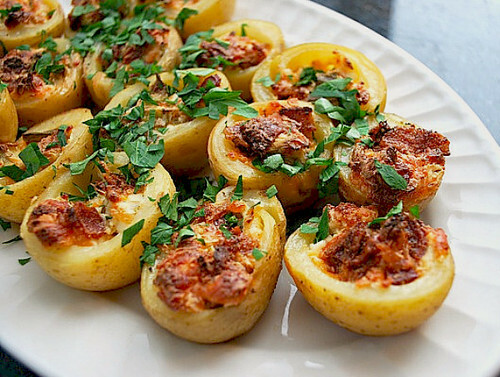 After you repeat this with all your potatoes, you should have these little potato cups that sit flat on its bottom. In a medium bowl, combine the remaining ingredients except for the parsley for the filling. Carefully fill each potato cup with the filling. Bake the filled potato cups in the preheated oven for 10-12 minutes, or until the filling has browned nicely. Remove from oven and allow them to cool slightly before service. Yum perfect for eating while watching football. These look great!!! ::adding to my football food list:: What a great idea to make them bite sized. These are a great idea! They are so cute and sound great! Those look so tasty!! And is there any higher compliment than the closed-eye mmmmmmmmm? Yum, perfect little beauties. Send some over to me please. Oh my, Oh my! These are the perfect treat just in time for football season - thanks for sharing! The potatoes looked so yummy! 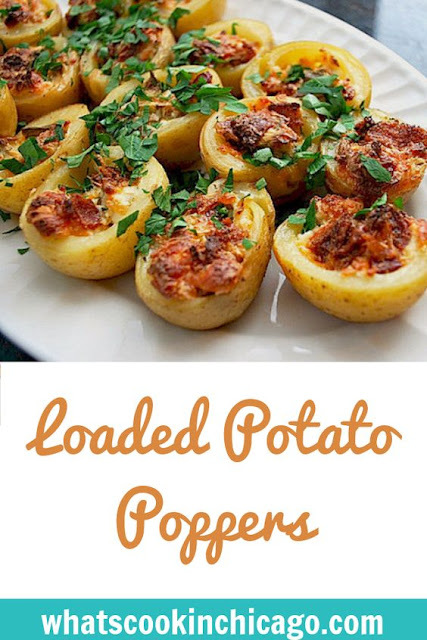 I'm not a potato fan but your photo really made me hungry :-) Thank you for sharing the recipe. these look great! and just in time for football season! Bacon, cheese, and potatoes, yum!